FILE - Peijun Guo wears the Oculus Rift VR headset at the Oculus booth at CES International in Las Vegas, Jan. 6, 2016. Facebook CEO Mark Zuckerberg seems to be realizing that the headsets his company's Oculus division has been making are too expensive and confining to appeal to the masses. Facebook CEO Mark Zuckerberg seems to be realizing a sobering reality about virtual reality: His company's Oculus headsets that send people into artificial worlds are too expensive and confining to appeal to the masses. 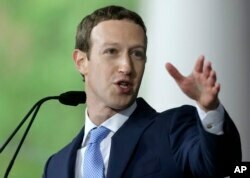 Zuckerberg on Wednesday revealed how Facebook intends to address that problem, unveiling a stand-alone headset that won't require plugging in a smartphone or a cord tethering it to a personal computer like the Oculus Rift headset does. "I am more committed than ever to the future of virtual reality," Zuckerberg reassured a crowd of computer programmers in San Jose, California, for Oculus' annual conference. Facebook's new headset, called Oculus Go, will cost $199 when it hits the market next year. That's a big drop from the Rift, which originally sold for $599 and required a PC costing at least $500 to become immersed in virtual reality, or VR. Recent discounts lowered the Rift's price to $399 at various times during the summer, a markdown Oculus now says will be permanent. "The strategy for Facebook is to make the onboarding to VR as easy and inexpensive as possible," said Gartner analyst Brian Blau. "And $199 is an inexpensive entry for a lot of people who are just starting out in VR. The problem is you will be spending that money on a device that only does VR and nothing else." Facebook didn't provide any details on how the Oculus Go will work, but said it will include built-in headphones for audio and have a LCD display. The Oculus Go will straddle the market between the Rift and the Samsung Gear, a $129 headset that runs on some of Samsung's higher-priced phones. It will be able to run the same VR as the Samsung Gear, leading Blau to conclude the Go will rely on the same Android operating system as the Gear and likely include similar processors as Samsung phones. The Gear competes against other headsets, such as Google's $99 Daydream View, that require a smartphone. Google is also working on a stand-alone headset that won't require a phone, but hasn't specified when that device will be released or how much it will cost. Zuckerberg promised the Oculus Go will be "the most accessible VR experience ever," and help realize his new goal of having 1 billion people dwelling in virtual reality at some point in the future. Zuckerberg, though, remains convinced that VR will evolve into a technology that reshapes the way people interact and experience life, much like smartphones and social networks already have. His visions carry weight, largely because Facebook now has more than 2 billion users and plays an influential role in how people communicate. But VR so far has been embraced mostly by video game lovers, despite Facebook's efforts to bring the technology into the mainstream since buying Oculus for $2 billion three years ago. Former Google executive Hugo Barra now oversees Facebook's VR operations.